On Writing: A Memoir of the Craft is a memoir by American author Stephen King that describes his experiences as a writer and his advice for aspiring writers. First published in 2000 by Charles Scribner's Sons, On Writing is King's first book after being involved in a car accident a year earlier. In 2010, Scribner republished the memoir as a 10th anniversary edition, which featured an updated reading list from King. 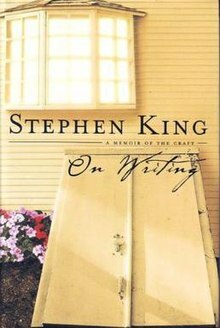 On Writing is organized into five sections: "C.V.", in which King highlights events in his life that influenced his writing career; "What Writing Is", in which King urges the reader to take writing seriously; "Toolbox", which discusses English mechanics; "On Writing", in which King details his advice to aspiring writers; and "On Living: A Postscript", in which King describes his van accident and how it affected his life. In 2008, Entertainment Weekly included On Writing on their "The New Classics: Books – The 100 best reads from 1983 to 2008" list. Both Sharon Johnson in The Patriot-News and Julie Woo for the Associated Press, in separate reviews, praised King's advice as "solid". John Mark Eberhart, writing in the Sunday Free Lance-Star, called King's writing advice "pedestrian", but ultimately concluded that On Writing was "a slight but transitionally important work that should lead [King] to better things." On June 19, 1999, King was hit by a van while walking along Maine State Route 5. Following the accident, King struggled to return to writing, uncertain whether he would be able to publish another novel. In an interview with NBC, King stated, "After the accident, I was totally incapable of writing. At first it was as if I'd never done this in my life. ... It was like starting over again from square one." In January 2000, King wrote on his website that he had finished On Writing and was more optimistic about his career, stating, "My endurance is much less than it was and my output has been cut in half, but I am working." The final section of the book is titled "On Living: A Postscript", and it reflects on the accident and details his return to writing, stating "things have continued to get better. ":269 On Writing was the first book King published following his accident. The second section is titled "What Writing Is". Comparing writing to telepathy, King briefly reintroduces himself and includes an example of literary description. King urges the reader to take writing and his advice seriously. :103-107 The third section, "Toolbox", discusses English mechanics and the importance of vocabulary, grammar, and style in writing. :111-137 The fourth section, "On Writing", details King's advice on writing. The fifth and final section, "On Living: A Postscript", discusses the accident in 1999 in which King was struck by a van while walking down Maine State Route 5. In the United Kingdom paperback version, a short story by Garret Adams entitled "Jumper" was included at the end of the book. The story won the On Writing competition. In 2008, Entertainment Weekly listed On Writing 21st on their list of "The New Classics: Books – The 100 best reads from 1983 to 2008". Sharon Johnson, in a review published by The Patriot-News, wrote that King survived his car accident "with his skill intact", calling King's advice "solid" and "an unexpected gift to writers and readers." Peter Sobczynski, a correspondent for the Post-Tribune, called the book "a fun, incisive read", specifically highlighting its emotional power: "In writing candidly and honestly about his recovery from a trauma that should have killed him, King has never been more affecting. Obviously, it is a good thing he was able to survive and get back into shape on a physical and emotional level." Julie Woo for the Associated Press also called King's advice "solid", specifically about dialogue and plot. However, Woo also observed that "many other books about writing offer such advice and some are more inspirational and ambitious," noting how "King cannot replicate a formula for his success so he does the next best thing by describing his work habits and environment urging that consistency in those areas can be conducive to good writing." John Mark Eberhart wrote a mixed review in the Sunday Free Lance-Star. Criticizing King's recommendations on writing, Eberhart remarked that they were "so pedestrian that I can't remember when I first ran across any of them." On the other hand, Eberhart praised On Writing's discussion of King's personal life, stating that "King's writing about his own alcoholism and cocaine abuse is among the best and most honest prose of his career." Eberhart ultimately characterized the book as "a slight but transitionally important work that should lead [King] to better things." ^ a b "The New Classics: Books: The 100 Best Reads from 1983 to 2008" Entertainment Weekly, issue #999–1000, June 27, 2008. ^ a b Johnson, Sharon (1 October 2000). "King terrifies with account of accident". The Patriot-News. The Patriot-News Co. p. E04 – via Access World News. ^ a b Woo, Julie (29 October 2000). "It's great to be the king - THE MSTER SPEAKS: Stephen King 's writing is his life and his life is writing". Ventura County Star. Associated Press. pp. J05 – via Access World News. ^ a b Eberhart, John Mark (15 October 2000). "Not exactly the King of instructors". Sunday Free Lance-Star. 114 (289). Free Lance-Star. p. F7. Retrieved 13 September 2015. ^ a b c d e f g h i j King, Stephen (2010). On writing : a memoir of the craft (Scribner trade pbk. ed., 10th anniversary ed.). New York, NY: Scribner. ISBN 9781439156810. ^ a b Sharp, David (29 October 1999). "King admits difficulties since accident". Bangor Daily News (115). Bangor Publishing. Associated Press. p. B1. Retrieved 13 September 2015. ^ "Stephen King: The 'Craft' Of Writing Horror Stories". NPR Books. NPR. 2 July 2010. Retrieved 18 September 2015.